Step Into Meditation is our most comprehensive guided meditation course. This relaxing audio download will teach you how to meditate using a non-religious, modern approach that will appeal to both the complete beginner and seasoned practitioner. The language is down-to-earth and the exercises are easy to follow. Step Into Meditation really is a wonderful way to learn effective meditation techniques that will make a positive difference to your life. What happens inside Step Into Meditation? Step Into Meditation is a three part course. Each course is around 70 minutes long. Each course consists of a number of tracks, some of which are purely educational, some of which are experiential. First you will learn, and then you'll be guided through meditation exercises so that you can apply what you have learned. You'll be taken step-by-step through the process of meditation and, most importantly, you'll learn how to use relaxation and meditation techniques to enhance your everyday life. This is a journey of self-discovery that is enriching, informative and very relaxing! Learning how to meditate is really quite easy so long as you have the right teacher. In fact, a good meditation teacher can usually train beginners to meditate in just three classes. But what if you don’t really want to drive to classes? What if you don't even have time? Well the internet is a great place to quickly find information on how to meditate, but this can be a blessing and a curse. There are so many different teaching styles, so many different philosophies and so many different meditation methods that it can be tricky to find a meditation technique that you trust and that works for you. We understand. We know that you’re probably not interested in learning how to stand on your head, or how to breathe through one nostril. You’re probably just trying to find a straightforward way to meditate that is easy to understand and easy to implement. • You’re looking for a course that will teach you to relax – to really, deeply relax. • You’re looking for a simple way to quiet your mind. • You value your health, and perhaps you would like to be smiling a little more often. We regularly meet people who want to make meditation a part of their life, but say, "I’d love to learn meditation but I just haven’t gotten around to it." 1. They didn’t have the time or motivation to go to classes. "I’m so busy, I just couldn’t find the time on top of everything else I do". 2. They tried to learn meditation on the internet, but they couldn’t quite put it all together. "I read some articles and watched some YouTube videos, but some of the information was contradictory and I just couldn’t figure out which bits were important and which bits to skip over." 3. They couldn’t find a meditation teacher that they trusted, or they worried that meditation classes would be a bit too "weird". "I’m not into all that mumbo jumbo, I just want to know how to de-stress and quiet my mind". So for everyone we've ever met that can relate to these sentiments, Step Into Meditation is for you. One of the best things about this guided audio meditation course is that you can learn meditation in your own time at your own pace, and you can can revisit your classes whenever you want. 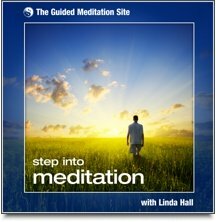 Step Into Meditation uses very down-to-earth techniques and offers practical advice that really makes sense. While this course is very educational, it’s not all about learning. It’s about experiencing meditation too. So as you progress from one track to the next, you’ll learn about meditation techniques and then you will have the chance to experience them yourself as your guide leads you through each relaxing exercise. Step Into Meditation takes a fresh look at meditation, brings it out of the traditional doctrine based paradigm and moves it into the field of body/mind awareness and psychology. It demonstrates how meditation can be a powerful self-help and self-development tool that's invaluable to anyone who wants to manage stress levels and get to know themselves better. "This is gold dust! The course is soundly constructed, straightforward and gloriously unpretentious, presenting a simple way to engage with the profound aspects of life without stepping into religious concepts. The language is really clear and accessible. It’s so simple and wise it could be used widely in schools." "Your meditation courses have changed my life. I have always been very stressed and was rushing around every minute of the day. I’m a much more mellow person who doesn’t let the little things get to me. I take time to notice and appreciate life around me, and I now feel happy with myself and can cope with most problems that come my way." "You feel you are getting a massage for your mind, body and soul. Her method of teaching meditation is so accessible." "Linda has a wealth of experience and combines a variety of techniques and traditions in a way that is deeply healing. Her voice is warm, genuine and nurturing and she offers much down to earth wisdom you can use on a daily basis."